An essential element of beauty and self-confidence, the smile is one of the focal points of the face. The mouth plays a major role in nutrition, communication and health. Regular dental hygiene is the key to good oral health and contributes greatly to self-confidence. Regular removal of dental plaque on your teeth helps prevent the development of the bacteria responsible for gum inflammation (called gingivitis). If nothing is done to maintain good hygiene, gingivitis can degenerate into periodontitis causing the onset of mobility and then, in extreme cases, loss of teeth. With good habits which form an active part of your daily routine and regular sessions with your hygienist, you can maintain a healthy smile. They will share with you the health tips to keep your teeth and gums healthy. Thanks to the professional products used, we offer specialised bleaching treatments guaranteeing a long lasting deep enamel result. The basic principle of bleaching is the use of hydrogen peroxide or carbamide. It is a gel that reacts with the enamel and penetrates into the structure of the tooth and changes the colour of the dentine. The devitalised teeth can also be bleached through internal bleaching by injecting the product directly into the devitalised tooth. There are several contraindications to bleaching, among other things, the fact that crowns and fillings cannot be bleached. The absence of tartar, receding gums, decay or other pathologies must be checked and certified by a dentist to avoid any complications that may occur during the bleaching process. These treatments are not recommended for pregnant women, heavy smokers and teenagers up to 15-16 years. Their teeth are not yet mature; the roots are still very open and sensitive. Whitening: how does it work? The dental hygienist or dentist makes an impression of your teeth and passes it on to the dental technician. Your personalised and customised tray is created in the member laboratories of the Adent network. A week is required for the construction of the tray. After this time, a new appointment is made for the fitting. The method of using the tray and the whitening product is also explained. The trays can be worn for a few hours, by day or by night depending on your preferences. After several days, the results are already visible and after only 2 weeks, the treatment is complete. Your custom-made tray can be stored and reused for later, if required. As a reminder, a healthy dentition, without tartar and without disease is essential before starting a bleaching treatment. The Egyptians used a mixture of pumice mixed with wine vinegar and the Romans made mouthwashes with urine … If you cannot bear the colour of your teeth and you dream of having a smile like Julia Roberts, we advise that you do not use a home-made system like washing your teeth with lemon juice or baking soda, it is not good at all. Our teeth are alive, they evolve and their natural colour depends on several factors, internal and external. If you want to whiten your teeth, first consult your dentist and get professional advice. A harmonious and a radiant white smile thanks to our express whitening: a short treatment for an immediate result. Express teeth whitening in the surgery: valid in the Lausanne-Blécherette clinic, Eaux-Vives and Nations. The results observed on all patients are significant. The outcome is immediate and it takes a short time when compared with teeth whitening using the tray-based system. Healthy teeth, without tartar and without disease is essential before starting a whitening treatment. LES ÉLÉMENTS EN-DESSOUS SERONT CACHÉS SUR TABLETTE VERTICALE. Express teeth whitening is done by our dental hygienists who have graduated directly from the surgery. The work is done with professional, proven and known products. Once installed in one of our surgeries, the whitening product is applied on your teeth for 20 minutes. 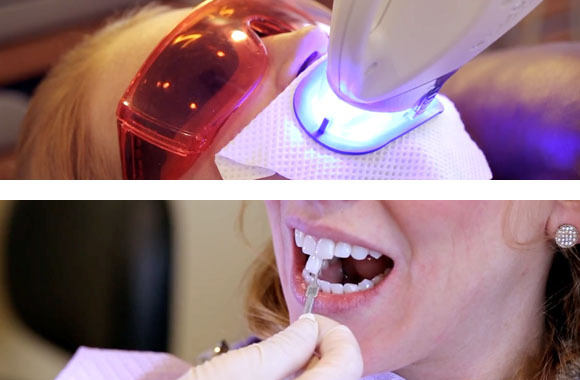 A purple light is projected on your teeth to activate the whitening product. To avoid sensitivities, vitamin D is applied to the gums. The result is immediate, you get a bright smile for 2 to 3 months. Do you have questions? Contact the nearest clinic or make an appointment. 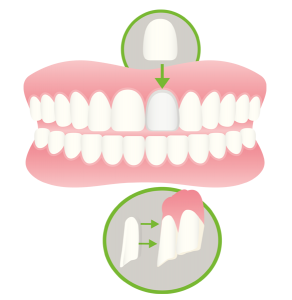 A veneer is a small, very resistant ceramic envelope that is fixed on the front face of the teeth. The colour is pre-defined in accordance with your smile and covers the natural tooth. They are placed on the visible front teeth to correct the contour, colour and dimensions to improve the appearance of the smile. They are made to measure to give you an optimal result, a natural effect and especially a long life. The dentist takes the impression of the teeth that he will send to the laboratory member of the Adent network to create the custom veneer. How much does a veneer cost? The price can be set only after a visit to your dentist. He performs a complete control and analyses the situation to provide you with a customised estimate. Our Adent group offers a network of dental clinics and laboratories throughout Switzerland. Each of our clinics includes all dental specialties to facilitate your access to care. By choosing an Adent clinic, you are sure to benefit from quality care provided by dentists known for their expertise.